In the marvelous science fiction story, The Time Machine by H.G. Wells, the blond haired Eloi who exuded beauty and kindness, but who were frail minded, became victims of cruel and brutal creatures called Morlocks. The story took the time traveler to a place thousands of years into the future. But back in the second decade of the 21st century, and in the reality that now confronts us, I found myself making a disturbing comparison between the fate of the Eloi with what is happening in Sweden. As the Muslim migration – some would characterize it as an invasion – predictably has turned violent, cruel and brutal rioting is now roiling Swedish cities and towns. Sweden was the first European country to fully embrace the 'diversity' myth, which posits that nation-states are unquestionably improved by a huge influx of non-native cultural aliens. It was also once one of the most peaceful countries in the world, then they welcomed in 600,000 Muslim migrants and the country is getting worse and worse, filled with Muslim violence and intolerance. Many Swedes were horrified in early 2017 when U.S. President Donald Trump linked such immigration to rising crime in Sweden, but an increasing number now agree with him. As I have written before, the vogue for 'multiculturalism' – along with its pernicious and suicidal handmaiden of 'political correctness,' – is effectively a process by which the native culture is supplanted and replaced by a foreign one. It is otherwise known as invasion and conquest and has since spread to other nations, to the manifest detriment of each of them. The list includes many of the countries in the EU: France, Germany, Holland, Belgium, Spain, Italy, Denmark, Norway and Britain. Countries in Eastern Europe, such as Hungary and Poland, who also have stark and painful memories of past Islamic invasions and occupation during the Early to late Middle Ages, and more recently, have refused to allow Muslim immigration and are thus free of the depredations their neighbors in Western Europe, Britain and Scandinavia are now enduring. Japan prefers to remain Japanese and bars Muslims from immigrating. And yet in the West the manic ability to continue to prize 'diversity' at the expense of national cohesion continues, aided and abetted by the international mainstream media which is completely on board with the cultural-Marxist program of Western cultural destruction. 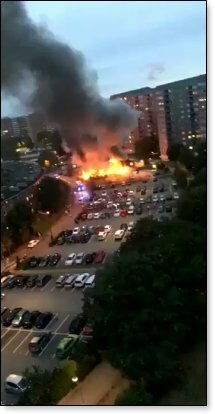 "Youths" torched and vandalized scores of cars in the Swedish city of Gothenburg and surrounding towns and Prime Minister Stefan Lofven said the disturbances looked, "organized, almost like a military operation." Sweden has seen a rise in violence in areas with high Muslim populations and attendant social problems and this latest rioting echoed the rampaging which took place in the capital, Stockholm, in 2013. Note the word, "youths," which has become a standard journalistic euphemism for "young Muslim males." Just as in Paris, where cars routinely are set on fire, the "youths" are none other than Muslim migrants but Political Correctness forbids identifying the miscreants, especially if they are Muslims. Swedish television reported that around 80 cars were vandalized and burned in the various cities. The PC media described the youths setting the cars on fire as "dark-haired" youngsters. The violence comes just three weeks before Swedish voters go to the polls in a general election. Will the Swedes finally vote for politicians who will allow Sweden to protect itself from the path of cultural and national suicide or will Swedes be condemned to remain as impotent as the Eloi? Have you noticed that whenever Islamic individuals or organizations engage in violence against non-Muslims – and cite Islam as the reason for their behavior – the mainstream media and Leftist politicians instantly tell us the exact opposite: that their actions have "nothing to do with the reality of Islam," to quote John McCain and Barack Hussein Obama. "Let them not think that they are protected against invasion, those who are at a distance from the theatre of war! They, too, will bow the neck beneath the yoke, and be mowed down by the sword, unless they come forward to meet the invader. The Turks have sworn the extinction of Christianity. A truce to sophistries! It is the moment not to talk, but to act and fight!" Later in 1565 when a massive Islamic fleet threatened the tiny island of Malta, another pope, Pius IV, complained that the king of Spain, "... has withdrawn into the woods and France, England and Scotland are ruled by women and boys." Not so different from today's reality! Back to the present and the same observations can be made about the existential threats from the Islamic State, Iran, Turkey, Hamas, Hezb'Allah, and every other jihadi organization. In 1971, our neighbor to the north, Canada, became the first country in the world to enact an official state-sponsored policy of multiculturalism. At the time, Canada was 96% European. There was no vote, and there was no referendum. Canadians were never asked, and never agreed. As in all Western countries, multiculturalism was imposed without the voters consent. Now across the entire Western world, undemocratically imposed multicultural policies are reducing citizens, primarily Europeans, to minorities within their own nation states. Herein is the unleashed Hell of Political Correctness, Multiculturalism and Diversity. Victor Sharpe is a prolific freelance writer with many articles published in leading conservative websites. He is also the published author of several books of short stories and the four volumes of his acclaimed work, Politicide, which deals with the Islamic threat to Judeo-Christian civilization, Israel and the Western way of life.